The first ever fake tan that I used was St Tropez, my Mum bought me it for Christmas and I was sooo excited. Of course, it didn't look like the ones above as they have changed all of their packaging and revamped lets say. I did absolutely love it, and it was as if it was the only tan that existed to me and my friends back in the day, but I remember going into Boots and paying about £25.00 for a spray on bottle, the colour looked amazing, but I used the whole bottle in one night... since then I stopped using St Tropez because I just couldn't afford it for the teeny amount that you got. However, I got the middle 'gradual tan' free with a magazine recently and i've got to say it is still an amazing formula, i'd personally never use the every day gradual tan as my 'every day tan', i'd always use normal fake tan first, and then apply this every day for a week to keep my colour up. This product does work really well but it is around £20.00 and I usually just use a Dove every day gradual tan which is around £4.00 after I've tanned, i'd say they're both equally as good. I was lucky enough to win the other two bottles of tan from other bloggers giveaways, I was really excited because the packaging has changed and they seem to have gone for a new look, I have to be honest and say that I haven't used the bronzing lotion yet (I will go and try it now and report back) but I have used the bronzing spray. I used this because I was in a major rush one night and just grabbed it, applied the tiniest bit and had an instant colour, however, you can never see the real effects of fake tan until the morning after - I was quite alarmed when I woke up and I was a greeny shade, but I know that some fake tans do go green so I took some deep breaths, washed it off and I was left with a gorgeous colour to tell you the truth. It retails at £26.49 which is good, but I wouldn't personally say it's the nicest colour i've ever seen. 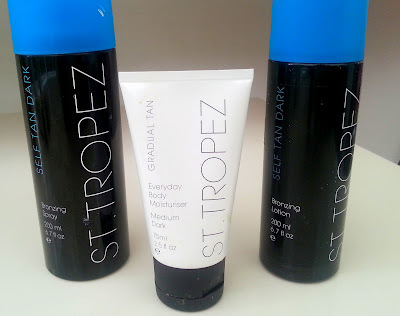 The tan does smell nice but it doesn't feel as nice or as kind to the skin as other fake tans i've used have.I think I need to use more of their new collection and then I can really decide how I feel about St tropez. After been hooked to the old St Tropez but deciding I couldn't afford it, I moved onto St Moriz. I was so against this tan when I first found out that people were using it as they've even copied St Tropez' name, but then I was hooked. I couldn't understand why i'd been paying so much for fake tan when this little beauty ranges from £2.99 to £4.99. I've used the mousse version and the spray can version, the bottles last a long long time, even if you put as much on as I used to. The only problem is, because it is an insanley cheap fake tan, if you put too much on ,you do go orange, or green. When you wash it off, most of the colour comes off unless you make yourself look black the night before. Because it's cheap, it seems to really pick up colour on dry patches such as your knees and your elbows, so on a night out you will have very dark knees and elbows unless you're really good at applying it. Finally, it smells disgusting, that horrible fake tan smell. Now I have seen ALOT of girls have fake tan distasters with this tan, they may think it looks good (like I used to do) but it just doesn't, it does look cheap and fake... it's a shame because I did used to swear by it and when it's applied correctly and worn correctly it does look really nice - but I think it's difficult to not go over board with this tan. It makes you feel stiff and really smelly after applying it, unlike more expensive tans which smell nice and are moisturising. It also flakes off in the least subtle way ever. If you do want to try this and you are going to apply it properly, you can buy it from any sort of market/cheap beauty shop and they should stock it. It is worth a try, I find that on some of my friends skin this looks absolutely flawless yet on other friends it looks green and messy, which isn't what you want. I did love it, I think the only reason i've gone off it is because i've gone back to expensive tans and realised how incredible they are. I pulled together any 'random' tans that I have in my bedroom, by random I just mean that I don't have the collection, I just have one of each. The other day I used Makebelieve, which I was kindly given at the Leeds Blogger Event, I didn't really know what to think when I was piling it on, but i've seen it in House Of Fraser and Boots before and have always been intrigued because I like the packaging, I was so excited to try it. You get ALOT in a bottle, probably the most i've ever seen in one, so the value for money is good. 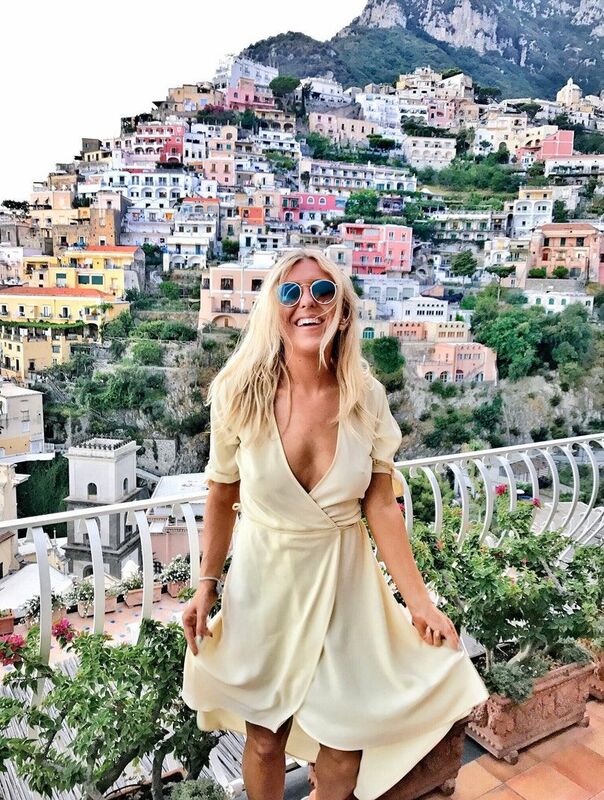 It feels really moisturising which is what I love about a fake tan, it actually felt like it was doing my body some good, I massaged it into my legs and I felt really moisturised which is what I look for in a tan nowadays. The best part about this is that it actually has antidoxidants and lots and lots of good oils/butters in it which help to fight against cellulite, this is great for girls and it's my legs which I hate and the reason I go to the gym is to tone my legs, so this is the perfect solution for me. It does smell beautiful as well. I noticed that this tan wasn't streaky at all, unlike St Moriz the colour was faultless. The only one problem I did have (which is my fault) is that I put far too much on my hands so my hands went too dark, that's just me been rubbish at applying it though so I'm not juding my hands by it, it was still a gorgeous colour. This retails at £24.50 which isn't bad to say it acts as a moisturiser, cellulite fighter, fake tan AND it will last you a long time. Big thumbs up for Makebelieve. 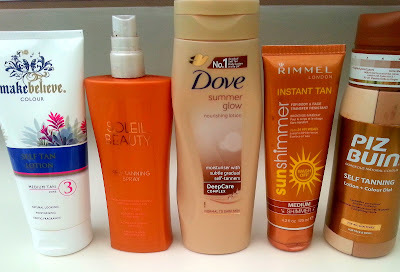 In my randoms there is also a Soleil Beauty which was just from Tesco when I quickly needed some cheap tan, erm it is okay apart from it feels like you're spraying sun tanning oil onto your self, which just makes your body feel stiff. The colour wasn't that great unless you put the whole bottle on and I don't even think they sell it anymore, so I wouldn't reccommend it for a really strong colour. Dove summer glow is one of my fave products, it's just amazing. I put it on the day after i've fake tanned and continue to do this for at least a week, it just ensures that your colour stays vibrant but also stops your tan from flaking off. Rimmels instant tan is good, but be careful not to put too much on as it can go a dirty brown/grey colour. It has ALOT of shimmer in it which isn't really for me but you can't really see it in the dark, people have commented on how nice the colour is but it does feel sticky for a while, the other downside is that when you jump in the shower, it all comes off because it's instant, but If you like instant tan then it really does serve its purpose, I got it on offer at Superdrug for £3.00 which is really worth it. I have a bottle of Piz Buin in the photo and I do believe that as a brand they've kind of dissolved from the fake taning market, i've personally never noticed it being that good a tan, but I did used to use it years ago, I think today they may have changed the forumla and I have used their sun tan lotions, but I also wouldn't reccommend these as they didn't improve my tan whatsoever, they're also VERY expensive.From this random list i'd go for Makebelieve and then Rimmel instant and of course, Dove colour is essential as well as fake tan it's self. Last but not least, and 100% I have saved the best til last, Xen-Tan. I'm pretty sure you'll know by now that I am a Xen-Tan obsessive. However, if you don't believe me when I say how good it is, many girls have bought it after reading my previous reviews and have sent me messages to say how good they also found it! I have used most of their tans, I loved the spray tan version because it just smelt delcious and the texture was silky and moisturising yet acted like a spray tan. I've also had proffessional Xen-Tan spray tans before and it's just the deepest yet most natural colour i've ever seen (you can get these at Saks salons). Who said that such a deep colour can be so natural? I have done a deatiled review of most of Xen-tan's products on other blog posts. Click here to read about the Dark Lotion Absolute Luxe and here to read about their Mist Intense. Needless to say, they are by Xen-Tan and therefore, they are amazing products, each and everyone of them, for different reasons. My favourite tan OF ALL TIME, out of the thousands that i've used, has got to be the Dark lotion, which I am yet to do a single review of. This is the tan that I wear all the time, it's only £21.95 and I swear by it. It's their best seller for a reason, it's moisturising, smells heavenly and is the most natural, streak free yet deep colour i've ever seen. You get endless compliments when you wear this tan. Also, at the Leeds Blogger event, I was lucky enough to get the Xen-Tan Face tanner to try, I was sooo excited as I've wanted to get myself a face tanner for ages, I now put it on every time I fake tan, I actually went to the supermarket the other day with no foundation on as this face tanner left me with such a sun kissed glow on my face. I also put it on underneath my foundation now as it shines through like you've been sunbathing, I am in loveee. For a big bottle it's only around £15.00 which is good as it will last you forever as the face is such a small area to tan. Recently I cheated on the dark lotion with the mousse intense which is just as fabulous, it does look greeny to begin with, but this is meant to happen! So do not worry, and I assure you, when you wake up, you will have the most perfect tan. Lucky for us, Xen-tan now do little sample versions which are £3.99 for 30ML, so not that small at all! Even if you just fancy having a really professional looking tan for the Christmas season, you can try it with this. 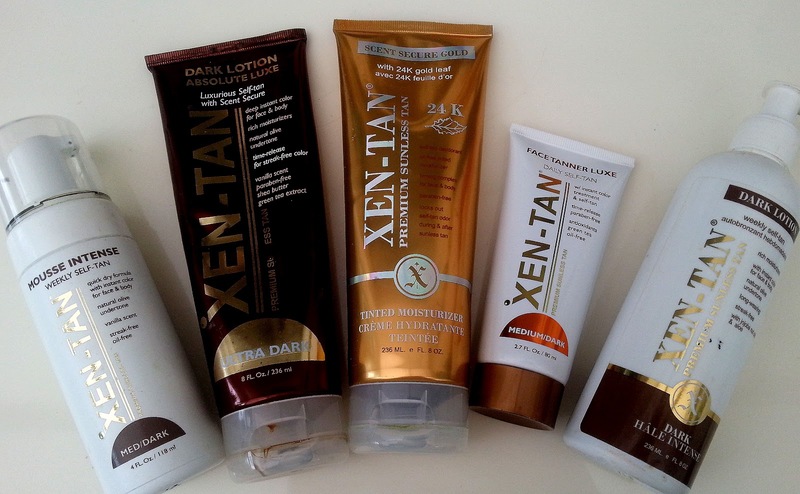 I promise you won't regret spending your money on Xen-tan. It's now an essential part of my life. If you want to buy my favourite tan for cheap, I reccommend Feel Unique - get it here. I hope that this has helped, please let me know which fake tans you use, which you love and which you hate. Above is a video of me disussing my own fake tanning routine and how to fake tan and the other is me applying fake tan. Don't forget to leave your Youtube URLS below so that I can subscribe to you. Yay! Thank you. I also love St. Tropez. It is def worth the splurge and it smells good too (unlike so many fakies). Maybe I will try the Xen Tan next. I used to be a solarium addict... I worked at one... You're right it is SO addictive, and SO bad for you!! Much better to fake it. I'm surprized at how much you dont like St.Mortiz ...I use it all the time & always get asked which tan I wearing (I have been doing tan for years & have gotten pretty good at it so that might be something to do with it). I always use L'Oreal sublime bronzing lotion face & body which is about £14 - its a great fake tan, the only downside is it takes a while to dry but even after you get washed it leaves you with a gorjiz caramel colour. You should do a review on it. Honey I'd 100% recommend you try out Sienna X's Dark Glowing Self Tan. I'm really fair naturally but this one is perfect for all skin tones and gives a lovely colour! This post was really helpful though, thanks!! Great post! I'm always looking for a good fake tan! Now I have tons of options! oh!! love your blog!! Im following u honey!! have you tried L'Oreal Instant Bronze mist? I've sworn by it for 3 years, I'm naturally very fair but the color delivered is intense while still looking natural. Such easy use, streak free :) Your blog is too cute, btw! LOVE this post, so helpful and informative. I'm a Xen-Tan devotee and definitely won't be straying now! I love the pictures. There's also ways on having tanned skin. You may also go to Portland’s most desirable tanning salon at 2160 West Burnside Portland OR 97210 or just call this phone number 503.926.8622 and we’re looking forward to serving you and doing everything we can to help you achieve your deepest, darkest tan. How Much Is My Face Worth Beauty Bloggers TAG?